Did you buy your first laptop just because it was good looking? 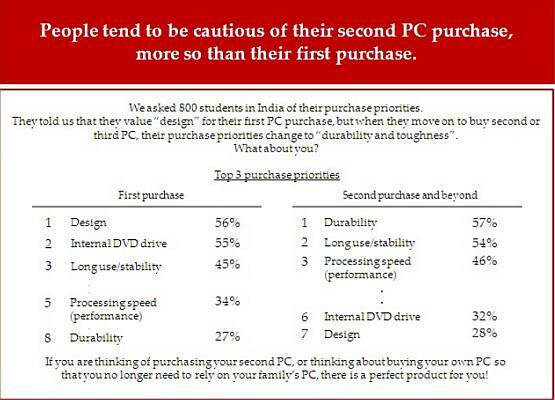 A survey says a majority of India's Generation Y buys their first laptop depending on looks and design rather usability and performance. The survey, commissioned by PCQuest, says 56 percent of them go for design and other factors like internal DVD drive more than long use or stability and processing speed that determines performance. Durability is last on their minds. However, when it comes to their second laptop purchase, they are more conscious and tables are reversed. Durability along with long use and stability becomes their first demand. Internal DVD drive and design etc. come last. The study focussed on laptop users in the 18-27 age bracket, across seven major cities including Ahmedabad, Bangalore, Delhi, Kolkata, Lucknow, Mumbai & Pune, primarily in second year of graduation from engineering, economics, law and other colleges, of which half of them were using their first laptop and the other half were seasoned users i.e. they had 'graduated' to their second machine, and in a few cases their third or more. Sir/Madam You are comparing mobile phones on the basis of CPU speed cache Ram size speed all that.